— products that both make a strong statement and perform an essential function. — they have all the characteristics of a high-end, architectural-grade, custom-designed system. message to guests arriving at the gate that they have come to a place of importance. monitoring feature. Linear at the gate says it all. And has it all. resident decides not to grant access, hanging up or pressing a key will disconnect the visitor's call. 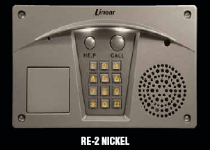 the outside caller will be re-connected to the resident. with the visitor and grant or deny access from the remote telephone. called by entering a short code at the keypad. voice communications with the entry system. individual (non-block coded) transmitters is not supported by the RE-2N. 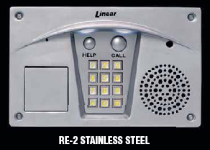 entry codes, wireless transmitters, automatic access control, call forwarding, and the "Do Not Disturb"
be programmed. Each of the seven time zones can be set to be active or inactive during a holiday. "service" switch or automatic timer that will disable the Relay #1 when required. has been entered at the keypad. through the RE-2N’s built-in modem. connected to the same line, or by calling from any remote telephone. obstacle events to the RE-2N receiver. Obstacle signals from an MGT transmitter will activate Relay #2.
an alarm during forced entry. Five other activation options are available for Relay #2.